(a) Check for foreign matter around the switches that might prevent operation. No foreign matter is found. 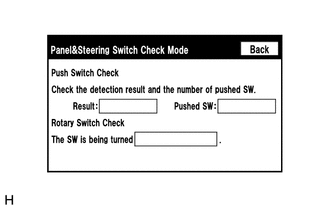 (a) Enter the "Panel & Steering Switch Check Mode" screen. Refer to Check Panel & Steering Switch in Operation Check (See page ). (b) Operate the abnormal switch and check if the switch status is correctly displayed. The switch status is correctly displayed as operated.